Railway staff at Edinburgh Waverley have accused a contractor of breaking promises . Strike: Staff hit out over 'lousy' accommodation. Railway staff at Edinburgh Waverley are going on strike after accusing a contractor of breaking promises about improving their "lousy" accommodation. The ISS contract staff, who clean and maintain the train station, say they were promised improvements such as air conditioning. No changes have been made according to the RMT union, which has now called for the facilities staff to strike on Sunday January 27. RMT general secretary Mick Cash said: "The fact that low-paid ISS contractors are being forced to strike over broken promises to improve workplace conditions is a scandal and the company should be hanging their heads in shame. 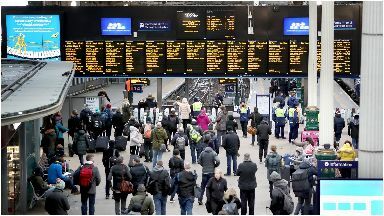 "The working facilities inflicted on this core group of rail support staff are a disgrace to the railway in Scotland and an appalling indictment of the way that private contractors think they can get away with treating their workforce. "It is clear that the only way we can get ISS to keep their word on making substantial improvements to their staff accommodation and facilities is by taking strike action." A union spokesman added: "These staff are having to stay in lousy accommodation despite promises to improve it nothing has been done. "We have been demanding talks with ISS but have heard nothing. The ball is in their court." 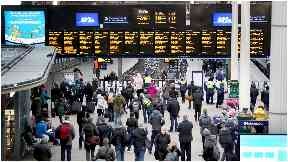 An ISS spokeswoman said: "ISS is aware of potential strike action by employees at Edinburgh Waverley train station. "We take the welfare of our employees very seriously and are in discussion with the RMT Union and LNER to resolve the matter."